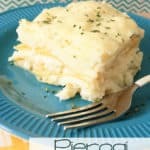 A pierogi casserole recipe with lasagna noodles, mashed potatoes, American cheese, butter, and onions. Spray a 9 x 13 baking dish with nonstick spray. Lay 3 - 4 lasagna noodles in one layer, overlapping slightly as needed, in the bottom of the baking dish. Spread 2 cups of mashed potatoes evenly over the noodles. Sprinkle 1 tablespoon of minced onion over the mashed potatoes. Layer 6 slices of American cheese and 5 thin slices of butter. Repeat these layers twice more, for a total of three layers. Cover with foil and bake at 350 degrees for 25 - 30 minutes or until cheese is melted. Store leftovers tightly covered in the refrigerator.